My connection with Curtin began in February 2001 when I arrived in Perth to complete a BA in Graphic Design. During my 1st semester I was constantly stressed out. I loved the way the student volunteers made me and other students feel. As I had personally experienced being a newbie and being unfamiliar with everything and somewhat lost initially, I empathized with other new students. This led me to joining the student volunteers which led to a lot of rewarding work through which we made new students feel welcome. 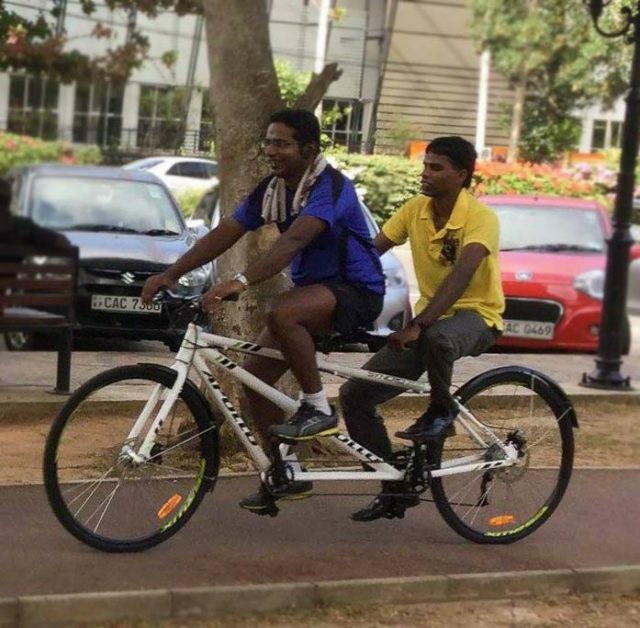 This experience with the student volunteers also helped me start a charity called TandemVision, to help the blind community of Sri Lanka go for bicycle rides on tandem bicycles, in the memory of my 3-year-old son whom my wife and I lost in 2016. One of my most beloved lecturers Jacque(line) Shaw taught me one of the best lessons in life which I carry with me in the world of advertising as a copywriter and teach others even to this day. For our design assignments, we had to submit every little doodle, sketch etc that helped us come up with the final design this was called the development file. One of my final pieces though quite embarrassing was submitted to Jacque. Later I found out that I had got a mark much higher than one of the best designs in class. Upon questioning Jacque how this was possible she said the following to me. Pointing at her empty coffee cup from Kirribilli Cafe Jaque said what was more important to her was not the final design of the cup but rather the ‘process’ of how I got to it, so that she knows in future when I start working I can always replicate that ‘process’ to reach a good end result.